Earlier this week, we reported PRESTO Mobile was set to debut from government agency Metrolinx, which handles and manages public transportation for the Greater Toronto Area and Hamilton Area. Details on PRESTO Mobile emerged from the slides ahead of a presentation today at the Metrolinx board meeting. The meeting has shed light on what users of PRESTO can expect in the new mobile app, as detailed in a demo by Karyn Allicock, Manager, Business Development for PRESTO. 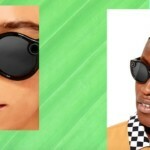 For starters, the PRESTO Mobile app will allow users to store up to 10 cards and let users load and pay for passes from all 11 transportation agencies, plus setup auto renewals and see their transaction history, as part of Phase 1 of the project, which has a timeline to launch by the end of 2018. Phase 1 of PRESTO Mobile involves letting users reload their existing cards using their smartphones and NFC. For Android users, this means full functionality will be available on newer phones with NFC. They just need to bring their card up to their phone and tap to reload on the go. But for iPhone users, Apple does not allow third party access to its NFC chip used for Apple Pay, so card reloads will take up to 24 hours, instead of being instant like on Android. 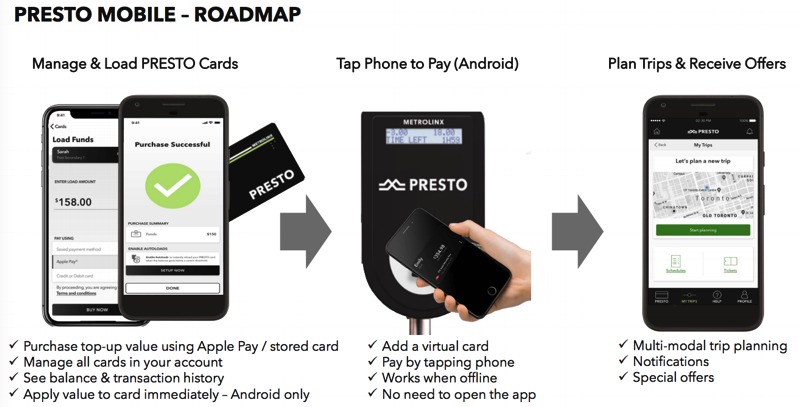 Annalise Czerny, acting Executive Vice President of PRESTO, also confirmed they are in talks with Apple, saying the company “emailed yesterday asking to meet again,” which suggests possible discussions about whether Metrolinx could tie into NFC on the iPhone at some point. Phil Verster, president and CEO of Metrolinx, said they would launch full mobile functionality with Android, then start negotiations with Apple to get the iPhone to the same place. Phase 2 of the project aims to let riders use their smartphones directly and skip PRESTO cards, by having a virtual card on their cellphone. Users would just be able to tap their phones to load fares and it would work even without a data connection. Metrolinx says their research has shown the Android versus iPhone mix in their test group has been “almost 50/50”. Curry concluded to say Metrolinx is “pushing the envelope” and they see this mobile move as an “opportunity to step ahead”, while saying their goal is to make travel easier, and not just make things that are cool. You can watch the Public Board of Directors Meeting, which took place earlier today, here (the PRESTO Mobile talks start at about the 1 hour mark).